Please click on the picture of the Schönbrunn Sheet to open the PDF file! This sheet gives you plenty of information and facts for your visit of Schönbrunn in Vienna. This includes the Top 10 attractions of Schönbrunn with a brief description. Those attractions can be found also marked in the city-walks Schönbrunn Map. 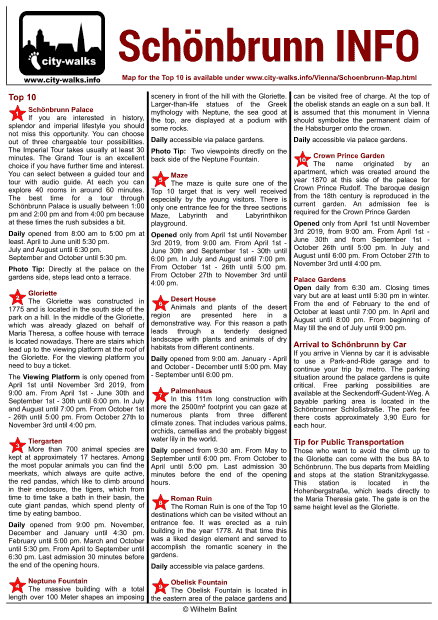 Furthermore, this sheet lists the opening hours and tips for the selected attractions around the palace. Proposals and facts for your arrival by car or public transport, as well as recommendations for the best places to take pictures. The PDF sheet is suitable for saving it locally on your smartphone or tablet PC, or simply print it on an A4 sheet which you can take along. So, you have the possibility to organize your trip in an easy way and to concentrate your attention on-site at the selected targets.